Is Facelift Surgery Your Anti Ageing Solution? Home > Surgery & Treatments > Is Facelift Surgery Your Anti Ageing Solution? For many of us seeking to find ways to fight the visible signs of ageing, cosmetic surgery seems like a good anti ageing solution. Facelift surgery, in particular, will help to restore the youthful appearance of the face and delivers more effective, longer-lasting results than many of the anti ageing treatments, creams, lotions and more on the market. But like all cosmetic surgery, facelift surgery has potential side-effects and drawbacks and it is important that you understand these before deciding if it is an appropriate anti ageing solution for you. How Does Facelift Surgery Make You Look Younger? As part of natural ageing and loss of collagen and elastin, combined with the prolonged effects of gravity and bad lifestyle habits, such as smoking, the skin on our face starts to sag and go slack, causing folds and deep creases to appear, especially between the nose and mouth, and also causing “jowls” to appear along the jaw line. A facelift (also known as rhytidectomy or cosmetic surgery of the face) can help to reverse these changes by removing excess fat and skin, and tightening up the skin around the face and neck. First, you will be anaesthetised – this may be a general anaesthetic, where you will be asleep, or a local anaesthetic combined with sedation, where you will remain awake but are numbed to pain. Discuss options with your surgeon and anaesthetist to decide what is best for you. The surgeon will typically make incisions above the hairlines at the temples, extending downward following the natural creases in the skin, along the earlobe and behind the ear, down to the lower scalp. Following natural ceases helps to minimise scarring after the surgery. Next, the surgeon will separate the layers of top layer of skin and muscles from the deeper facial tissues and remove the excess fat and loose skin. In some cases, he may reshape the muscle tissues and skin as well. Then the skin is redraped and stitched or stapled back into place. Most cosmetic facelift surgeries take 2-3 hours and sometimes, drainage tubes may need to be left in place under certain areas of the skin for a further few days to help reduce any post-surgical swelling. 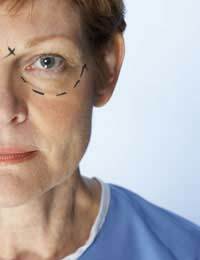 There will be quite a lot of swelling after the facelift surgery, including the eyelids and other facial areas. Usually a large, fluffy dressing is applied straight after the surgery and this is removed after one day, to be replaced by an elastic wrap. The swelling will be accompanied by some discomfort and pain and this will usually be managed by medication. Any strenuous activity should be avoided until the swelling has subsided – it make take 4-6 weeks for the swelling to subside completely but most should have reduced enough within 2 weeks for you to be able to take part in some social activities. Recovery is generally good within 6 weeks, although the skin on your face may feel rough and dry for a few months. Note that it is very dangerous to smoke during the time around cosmetic surgery – you should refrain from any smoking for a month before and at least a month after surgery. Not only does stopping smoking help the healing process but research has shown that in one in ten smokers, the skin around the incision site will die if they continue to smoke after the surgery. The main benefit is that if everything goes to plan, cosmetic facelift surgery delivers relatively instant results which last for quite some time. Certainly compared to the other anti ageing treatments, creams, potions and other anti-ageing solutions on the market, facelift surgery provide more obvious, quicker and longer-lasting results (often for as long as 10 years). This in turn may help to significantly restore one’s self-confidence and sense of self-worth, an important ingredient for general success in life and one that is often under attack as we age. Risks of Cosmetic Facelift Surgery. Like all cosmetic surgery, facelifts come with certain risks – there are the risks from anaesthesia, including adverse reactions to the drugs and respiratory and cardiovascular problems when a person is under anaesthetic. There are also risks from haemorrhage and infection after surgery. It is important to remember that despite what people promise you, there is no such things as a minor surgery. All surgery carries risks and all surgeries have the potential to be fatal – yes, you can die either in theatre or from complications after the procedure. The risks may be small but they are there so it is something that you must consider before deciding to go under the knife. You must be in good health before undergoing surgery and even there, there are no guarantees. In addition, there could be other side-effects of the surgery, such as a haematoma (pocket of blood) developing under the facial skin, which will need to be drained, and more worryingly, damage to nerves which control facial muscles. This is a rare complication and usually temporary but it can happen so you have to be prepared – remember, the face is a very delicate area of the body, with fine nerve control. Also, it can take a while for the swelling to subside and the scars to fade – sometimes several months – and there is still the risk of infection during this recovery time. Finally, you will continue to age and despite your efforts, your skin will almost certain start to sag and loosen again so many people undergo a second cosmetic facelift surgery. This can carry additional risks – and keep in mind the “strange” way many celebrities look when they have undergone surgery too many times! What Does Cosmetic Facelift Surgery Not Cover? Other procedures are often done at the same time as cosmetic facelift surgery. Since a facelift only gives improvements to the cheeks, jawline and the area between the nose and the mouth, but does not give a rejuvenating effect to any problem areas in the forehead, brow, eyelids and neck – candidates may elect to have other cosmetic surgery procedures done simultaneously – for example, a blepharoplasty (eyelid surgery) or brow lift or neck lift. Remember also that a facelift only tackles sagging skin folds so it will not improve the appearance of wrinkles and fine lines – for these, you will have to turn to skin resurfacing techniques, such as microdermabrasion and chemical peels, or injectable treatments, such as Botox.